What a joy it is for me to celebrate Mass here for the first time today! I was able to visit this church briefly last year, but now I’m so happy to be here with all of you for the celebration of Mass – and on such a beautiful day, the Solemnity of the Epiphany of the Lord. I’d also like to say a special word here at St. Michael’s about a priestly vocation which took root in this parish, that of Msgr. 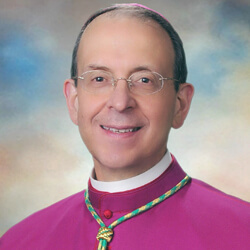 Arthur Valenzano, who today serves as the Rector of the Basilica of the Assumption in Baltimore. He was baptized here, and he celebrated his first Mass here. Msgr. Valenzano is one of the finest priests I have ever known, and I am personally grateful to this parish for nurturing his priestly vocation. Please join me in praying that many more young men from this parish and from throughout the archdiocese will hear Christ’s voice calling them to the Sacred Priesthood, and that they will be given the grace to respond with courage and generosity. Dear friends, during these days of the Christmas season, we read once again the beloved Gospel passages which tell of the birth of Our Lord, and of the events which followed, which were recorded with love by the Evangelists. One of the most familiar and mysterious elements of the Scripture readings of these days is the Star of Bethlehem, the star which led the Magi from the east to journey toward the Christ Child and to find Him – and to find in Him the truth which gives light and life to the whole world. So what was the star? Where did it come from? Well, back in the 17th century, an astronomer names Johannes Kepler calculated that in 6 to 7 B.C., which is around the time Christ was born, there was a convergence of the stars Jupiter, Saturn, and Mars, within the constellation Pisces. This same convergence occurred again in 1604, and in that year was accompanied in that year by a supernova, which is an enormous explosion in a distant star, an explosion which produces iridescent rays of streaming light. Dear friends, at this point we might profitably ask: what does this have to do with you and me? Let’s begin with the gifts brought by these wise men from the east: gold, frankincense, and myrrh. Frankincense signifies that the Child is a priest. Both in the Old Testament and in the New Testament, we see that incense is used by priests. It is burned in sacrifice to God, and represents both the purifying of our worship, and our prayers ascending, with a sweet fragrance, to the presence of God. In the Old Testament, the temple priests offered the blood of bulls and goats in sacrifice to God for sins. Yet Christ, the fulfillment of all the prophecies of the Old Testament, offers himself. The Blood he shed on Calvary is “the Blood of the new and eternal covenant, which [is] poured out for many, for the forgiveness of sins.” Indeed, when every validly ordained priest of the New Covenant stands at the Altar and, [by the sacramental configuration of his Ordination,] he makes present the once-and-for-all Sacrifice of Calvary, here and now; he applies the never-ending grace of that Sacrifice to you and me, for the salvation of our souls. During these beautiful and hopeful days of the Christmas season, let us pray especially for our brothers and sisters who have been away from the Church, and away from the sacraments. Let us pray that the love and the innocence of the Christ Child will touch their hearts and minds, and move them with the grace to return to Christ’s mercy, and to the life of grace in the communion of the Church. May God bless us, and keep us always in His love!